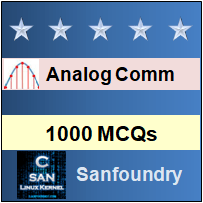 This set of Analog Communications Multiple Choice Questions & Answers (MCQs) focuses on “Power Calculation”. 1. If peak voltage of a carrier wave is 10V, what is the peak voltage of modulating signal if modulation index is 50%? Therefore, Vm = 10 X 0.5 = 5V. 2. Maximum Amplitude of an amplitude modulated 10V and minimum amplitude is 5V. Find its modulation index? Therefore, µ = (10-5)/(10+5) = 0.33.
instead at 2fm 2 x 3.4 kHz 6.8 KHz. B.W. =N(n+1)X fs = [24(7 + 1)] 8 kHz = 1536 KHz. 4. Sampling frequency of a signal is 6 KHz and is quantized using 7 bit quantizer. Find its bit rate? Explanation: Bit rate refers to the rate at which data is processed or transferred. It is usually measured in seconds, ranging from bps for smaller values to kbps and mbps. Bit rate is also known as bitrate or data rate. Tb = 1/42 , therefore Bit rate = 42 Kbps. 5. Calculate power in each sideband, if power of carrier wave is 96W and there is 40% modulation in amplitude modulated signal? 6. For 50% modulation, power in each sideband is ________ of that of carrier? so Pt = Pc(1 +(12/2)). On solving it we get Pt = 1.5Pc. 8. If each element of signal occupies 70ms, what will its speed? Explanation: The carrier signal is characterized by the number of signal intervals, or pulses, that are transmitted per second. Each pulse is called a baud. Bps stands for bits per second. Bps is a measure of how many bits can be transmitted during one pulse (one baud). 9. Power of carrier wave is 300W and modulation index is 0.75. Find its total power? Explanation: Given that m1 = 0.75 and m2 = 0.2. Total modulation index will be equal to By substituting values we have which is equal to 0.77. 11. Find the power saving for DSB-SC wave with 100% modulation? Explanation: In DSB-SC carrier is suppressed. In normal AM, carrier is not suppressed. Therefore, Power saving = ((Pc/2 )/( 3Pc/2 )) x 100% = 66%. Explanation: Field is a region around a charged particle or object within which a force would be exerted on other charged particles or objects. 13. Find the number of pulses, if the number of level is 128 in PCM? Explanation: A pulse in signal processing is a rapid, transient change in the amplitude of a signal from a baseline value to a higher or lower value, followed by a rapid return to the baseline value. 2n = 128, so n = 7.